Every year, for some reason I can't answer, I fall completely, stupidly, and passionately in love with a show that is just doomed to be canceled. Last year it was Aliens in America. That show was F&cking funny! It was funnier then most stuff on TV. 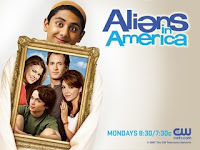 It was about a high school dweeb whose parents get him an exchange student from Pakistan so he has a friend. Like I said, doomed. I wish I could take a potion to stop this from happening, because it is devastating to get so involved in a show and then have it pulled out from under you. But for some reason I can't help falling hard and fast for a doomed show. Like a backpacker in an opium den. This year it is Valentine. Of course, it is on the CW. I think it is rated like 212 out of 214 shows. So doomed. It is just sad that there is no Tivo big enough to record all the dreck realty shows on. Heaven forbid that anyone would want to watch something that doesn't involve real people humiliating themselves intentionally. Posted by Heidi Schempp Fournier at 7:04 p.m. Yes Valentine... I have wanted to see this show. It has that British chick from Dexter on it. Kind of sounds like another "Dead Like Me" At least that show got 2 seasons. Dead Like Me! Again another doomed show I loved. The one good thing is that DVD's and the internet are making it easier to view missed or unreleased episodes. Or in the case of FireFly own great series.